My heart broke today. For the first time in my life my own people tried to ostracize me for simply standing up for a Free Tibet. I saw the unity of the Tibetan people and our struggle falling apart in front of my eyes. I never thought I would see the day when a fellow Tibetan, an organizer and community leader, would yell at me and call me ‘Shamday’ or ‘Shameless’. 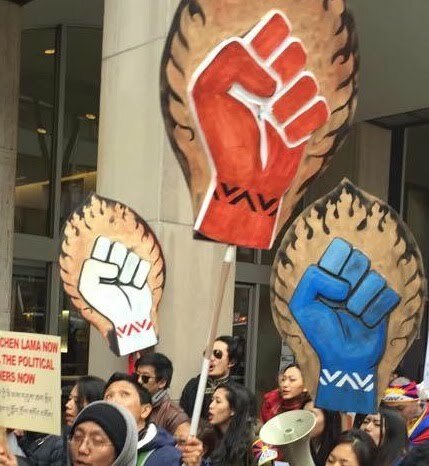 But this is indeed what happened today at the March 10th Tibetan Uprising rally in New York City. It was one of the most shocking experiences of my life. After organizing countless Tibet protests over the past fifteen years, for the first time ever, I glimpsed a future where we might lose everything we’ve been working for. In a truly outrageous and disheartening move, the organizers of today’s rally tried to kick out anyone carrying signs that said “Free Tibet” or “China out of Tibet”. I saw some of them actually go to the police and ask them to intervene. One of the organizers said: “We do not want those slogans in this protest. We are the organizers of this protest and “Free Tibet” and “China out of Tibet” are not allowed.” They even got the police to put up barricades to stop many of us from coming into the main square at the UN. And though the police were obviously confused by this request, they did it. At one point, the General Secretary of the Tibetan Community of New York & New Jersey even threatened one of our friends. He said: "Be careful. Don't get a bad name for yourself. You are going to suffer. SFT is going to suffer. Your family is going to suffer." This was because our friend was holding a banner that said: "March 10th. Tibetan National Uprising. Free Tibet." The Secretary also publicly declared from the stage that the organizers of the rally “support His Holiness and the Central Tibetan Administration.” He said this to manipulate the crowd and turn it against us, as if we were the people who are opposed to His Holiness and the CTA. I thought, how sad it is that they use His Holiness’ name for petty politics, but do not understand His teachings. One of the greatest sources of strength in my life is His Holiness. Throughout his leadership, His Holiness has led the Tibetan people with a greatness of democratic vision, advocacy of tolerance, and appreciation of diversity. Despite how upsetting this behavior was, I tried to talk reasonably with the organizers. But when I tried to engage with them, they flatly refused to listen. They would not talk to or dialogue with me in any way. Instead, I was shouted at and told that I was “shameless.” I looked at their signs supporting dialogue with China and found it ironic that they advocate talking to the Chinese but cannot even talk to a fellow Tibetan in the struggle. I went to the rally today not as an organizer but as a Tibetan citizen, as I have been doing since I was a baby in London. The reason for this is that SFT had to reluctantly withdraw from the March 10th organizing committee, because the other Tibetan community leaders made it clear that there was no place for our ideas and voices in the committee. We were going to be shut down at every turn, even though we’ve been helping to organize March 10th in New York and around the world since 1994. Our decision to withdraw from the committee was incredibly difficult and troubling for us. From my experience organizing March 10th in London and other cities, we bring youthful energy, creativity, optimism and inspiration to the events that we join. We also bring non-Tibetan supporters. Having supporters at our rallies shows the world - the people passing by on the streets - that Tibet is not just our issue, it is a global issue. But far from valuing support from non-Tibetans, the organizers today created an environment where our supporters were treated very badly. Today I watched two of our supporters being treated poorly by our own people just because they were with us - the so-called "Rangzen" people. My friend and colleague Lucy very politely asked a Tibetan woman in the crowd: "Are we walking to the Chinese consulate now?" The woman shook her finger in Lucy's face and said, “I'm not speaking to you." One of our oldest supporters in New York - a woman who went to Tibet in 1985 and has been an active member of the movement since then - was so upset by what she saw that she left and went home. What has become of us? Why are we so “divided”? In my opinion, this is really a false divide. We are in a struggle for the survival of our people and our nation. We may have differences of opinion but, ultimately, we need to set our differences aside and work together. But to be united, we do not all have to work in the exact same way or parrot exactly the same lines. We should not try to push out, exclude or silence people who may think a little differently than we do. That is what the Chinese want. And this is what they are doing in Tibet. This is not the world we, as Tibetans, want to create. As I reflect on this day, the only shame I can see is that Tibetan community leaders in New York & New Jersey are dividing our people by saying who can and can’t attend the March 10th protest. Joining a March 10th protest is the birthright of every Tibetan. It is our duty and obligation to speak out for our people inside Tibet who continue to bravely resist Chinese oppression. This event is organized for the public to commemorate our proud history of resistance to Chinese rule. It is not a private event to be controlled by a few people who expect everyone else to fall in line. March 10th is an emotional day, a historical day - we’re commemorating all of our people who have been imprisoned and killed by the Chinese. It is a day to speak up for our people inside Tibet. Ultimately, I believe that the handful of intolerant people who tried to hijack the March 10 rally today are a disgrace not only to the Tibetan struggle, but also a disgrace to the Middle Way Approach. However, we will not let their extremism hurt the Tibetan struggle. No matter what bullying tactics they try next, we will never let the message of the original people’s uprising – Free Tibet, Bod Rangzen, China out of Tibet – be forgotten from history. No matter what happens we will continue to fight for a free Tibet.